This page contains the personal reflections of Yallaludin Rumi’s experience of amazing grace. It also has a brief biography of this Persian Sufi mystic, poet and teacher. At first, the devil was my teacher, and soon he was no more than a puff of air compared to me. God saw all of this sinfulness of mine, but then He transformed it as if He never saw it so He could avoid embarrassing me. Mercy repaired the shredded cloak of my piety, and draped me in repentance sweeter than life itself. Whatever sins I had committed before, mercy considered them as never having occurred. Whatever duties I had failed to do, mercy considered them done. Mercy made me as free and pure as the cypress and the lily; it filled my heart with a sense of fortune and joy. It wrote my name in the Book of the Righteous. I had been destined for Hell; yet it gave me Paradise. When I had cried, “I’ve fallen to the very bottom of the pit,” my cry became a rope, and that rope was lowered down into my dark hole. I took hold of that rope and climbed out. I became happy and strong, committed and cheerful. Once I was lying in misery at the bottom of the pit; now I’ve transcended the whole world! Praise be to You, O God, for you carried me far from my distress. Even if the tip of every hair of mine could gain the power to speak, that still wouldn’t express the amount of thanks due to You. The name Mowlana Yalaluddin Rumi stands for love and ecstatic flight into the infinite. Rumi is one of the great spiritual masters and poetical geniuses of humankind. He was the founder of the Mawlawi Sufi order, a leading mystical brotherhood of Islam. During his lifetime he produced a prolific range of timeless inspiring and devotional poetry which encapsulates the Sufi experience of union with the Divine. Although Rumi was a Muslim and a great scholar of the Qu’ran, his appeal reaches across religious and social divisions. Even during his lifetime he was noted for his cosmopolitan outlook. His funeral in 1273, which lasted 40 days, was attended by Muslims, Jews, Persians, Christians and Greeks. 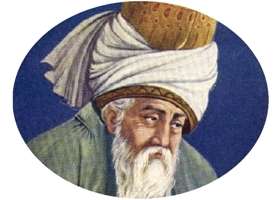 Rumi was born in 1207 in Wakhsh,Tajikistan, into a family of theologians. It was a period of great social and political turbulence, including the era of the crusades. Escaping the Mongol invasion and destruction, Rumi and his family travelled extensively in the Muslim lands and finally settled in Konya, Anatolia, then part of the Seljuk Empire. When his father, Bahaduddin Valad, passed away in 1231, Rumi, at the age of 24 already an accomplished scholar, succeeded him as a professor in religious sciences. Rumi met many of the great Sufi poets, including the Sufi Master, Attar. Attar is said to have commented about Rumi, then still a young boy: “There goes a river dragging an ocean behind it.” The most important turning point in Rumi’s life was when he met the wandering dervish Shamsuddin of Tabriz. Shams was eccentric and unorthodox, but filled with heartfelt devotion, that sometimes he couldn’t contain. He seemed to be quite different to the respectable and prestigious scholar. However Rumi saw in Shams a divine presence. This meeting and their close mystical relationship was instrumental in awakening Rumi’s latent spirituality and intense devotion. His love and then his bereavement at the death of Shams found their expression in a surge of music, dance and lyric poems, ‘Divani Shamsi Tabrizi’ (Divan). Rumi is also the author of a six-volume poetic work, set up in a teaching-style format, the ‘Mathnawi’, sometimes called the ‘Koran in Persian’. Rumi’s poetry is wide ranging and encompasses many different ideas, but behind all of it the essential theme is the absolute love of God and the longing and searching for the union with the Divine. Being a great mystic, his poetry was a reflection of his own inner consciousness. Ironically, Rumi said that no words could adequately explain the experience of the mystical union. Yet his words are inspiring signposts which point towards the Divine. His influence on thought, literature and all forms of aesthetic expression in the world of Islam cannot be overrated. Rumi’s poetry is so widely appreciated because it has the capacity to uplift our own consciousness. Reading the words of Rumi can awaken in us our own spiritual self.